Maryland Pink and Green: Special Guest, Lilly stationery, and a surprise! Hello-Hello, and welcome to a Wednesday! It is an especially fun Wednesday for TP, we are ever-so-excited to be guest posting here at Maryland Pink and Green! We have long enjoyed reading Bethany’s wonderful posts, and are flattered to be invited to pop in for a visit. Just sharing space with such a Lilly aficionado is impressive; let alone a woman who has actually visited the Offray Ribbon outlet! We will begin with what is the ‘hottest’ item in the new collection, the Lilly iPhone covers. Pre-orders for these are coming in at a record rate. 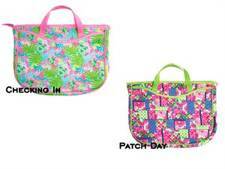 They are offered in four distinctive Lilly patterns: Checking In, Koi, White Zin and Coral Me Crazy. Below we have another shot of Coral Me Crazy. The next most popular item is most assuredly the Large Agendas, with the Pocket Agendas running a close second. The big change for Agendas this year is the switch to a 17-month format, sometimes called an academic calendar. The Agendas begin with this August and run through December 2011; new patterns include (L to R) Checking In, Koi, and White Zin. The most sought-after pattern for these is White Zin, with Checking In ordered almost as often. Koi is not as popular as these two right now, but we expect that to change and this darker color to become more popular with the arrival of fall and even winter. Recognizing how much people need to see the inside of the Agendas, we have posted photos on our PreppyPrincess.com Facebook page. The Large Agendas are $24.50 and the Pocket Agendas just $14.50; these are shipping now. If your guess is “Lilly Pulitzer Laptop Sleeves” you are absolutely correct. These look so fun, available in the Checking In and Patch Day designs. The cases are made of neoprene, and fit laptops with screens up to 15.4”. These are $36.50 and may also be pre-ordered for a mid to late August delivery. 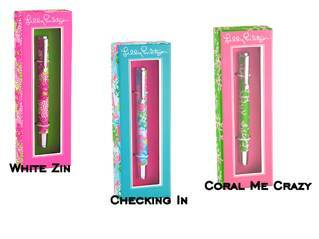 Something we haven’t yet posted about on our blog, the new Lilly Pulitzer Pens. The pens are $19.50 with new patterns available for pre-ordering, all other patterns ship immediately. 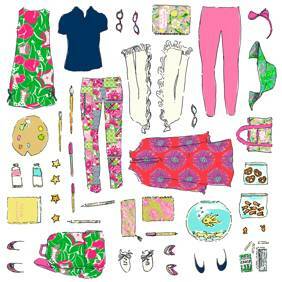 Another item we haven’t yet put on the site or featured in our blog, the new Lilly Pulitzer Paper Dolls set. The clothes for the new dolls are cute as can be, quintessentially Lilly. Perfect for the Minnie Lilly lover on your gift list this year, the Paper Dolls come in an illustrated box with a grosgrain ribbon handle ideal for easy transporting. Our final item is something that rapidly achieved “Hot Seller” status among the Lilly pre-order products. 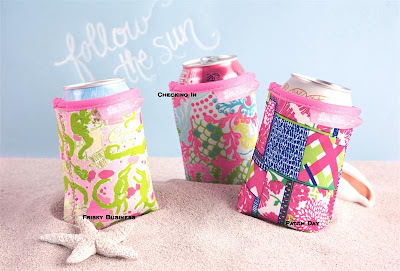 At only $5, the Lilly Koozies are offered in three great patterns: Checking In, Patch Day and our personal pick, Frisky Business. Isn’t that the best name? Destined to be great gifts any time, the Koozies are ideal as stocking-stuffers and other gifting occasions. To be on top of the latest news and receive special discount offers on our Lilly collection, sign up for our Lilly Pulitzer newsletter here. (You will need to scroll down a bit, the box you are looking for is on the lower right of the page.) You can rest easy when signing up; we will never sell or share your email address or other personal information, which is a promise. We hope you come visit us at the Princess, where shopping is fun again! We leave with an expression of gratitude to Bethany, you are just too nice to invite us over. We send you, and all of your treasured readers a big Princess smile! I am a follower of both blogs, fan of both on Facebook and my favorite item right now is the coozie, wait, maybe the pen...or, or the pocket agenda, I could use some more wrapping paper. Heck, I love it all! I am doing all 6 ... so 6 entries for me, please! I'm a follower of Maryland Pink & Green! I'm a fan of Preppy Princess on Facebook! I'm also a fan of Maryland Pink & Green on Facebook! just one thing I like on preppy princess?! I love the new lilly dress magnets and the new lilly market totes. Am a FB fan of MD P& G and PP, am also a blog follower of both. First, I love TP! And now I am happy to say that I am the newest folower to Maryland Pink & Green. Great blog. I would love to get my chubby fingers on the large agenda... Thanks for a great giveaway. I love the new Fall laptop sleeves! But on the whole PP website, I have to say I think the preppy platters are just great. 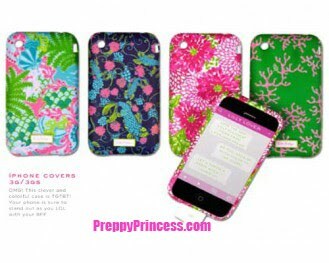 I am a follower of Maryland Pink and Green and I loooove the Lilly Pulitzer Letterpressed Correspondence Cards in Desert Tort at Preppy Princess! My want for an iphone has increased drastically with this blog post! Thanks for a great giveaway! I am 100% in love with the iPhone covers and have been dying to see LP cases since I got an iPhone.....Now which color to pick?! I orginially had my heart set on checking in, but I think I changed my mind to the Coral me Crazy case....hmmm. Thank you, TP and Bethany, for a wonderful giveaway! My favorite Lilly item on The Preppy Princess are the letterpress correspondence cards. I adore letterpress and am excited to see that Lilly Pulitzer added it to their fabulous stationery collection. I'm also super excited for the Lilly umbrellas. 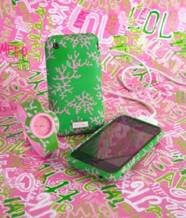 I am a follower of both Maryland Pink and Green and the Preppy Princess Blog. And of course I'm a Facebook fan of both the Preppy Princess and Maryland Pink and Green. I love the Lilly umbrellas! My favoirte item has to be the iPhone cover in Coral me Crazy. (@lms52) - I guess that means three entries for me! Great giveaway! I love the iphone covers. I'm a follower of the blog, fan of preppyprincess on facebook, and follow on twitter. So, 3 entries. I LOVE the iphone covers! I LOVE the Checking In and Coral Me Crazy prints...I did a post yesterday about the water bottles...they are my fav! 1. love the Lilly umbrellas to brighten a rainy day! This is such a wonderful giveaway, thank you Bethany and PP! I love every thing at the Princess, but I am extra in love with the laptop sleeve! I follow Maryland Pink and Green, I am going to post about the giveaway on my blog, I am a fan of the Princess and Maryland Pink and Green on FB and I'll tweet about it, so 6 entries! I just became a FB fan and posted a link to the giveaway on yesterday's Lilly post. ooh i am such a fan! thanks for this post-so cute! ps-if you get a chance, stop by my blog this week for 8 etsy giveaways! I'm really loving the coozies from the Princess. I follow both of you, and "like" both of you on fb. What a great giveaway, ladies! Thanks! This will be on my public blog! FlipFlops&Pearls sent me. Not sure I can choose just one?! iPhone covers, large planner, koozie, paper dolls - oh my!! I have a 2010 Lilly planner and love it. I receive so many compliments on it when I get it out of my purse. Thanks for hosting a wonderful giveaway. Love & blessings from NC! I "like" you on Facebook!! ...and my favorite new item in the umbrella. Fun way to cheer me up on a rainy day!! ...AND I'm a pink & green Facebook fan (but your link doesn't work). Thanks for a great giveaway!!! Just pre-ordered the phone cover. Couldn't resist and can't wait for it to arrive! I follow Maryland Pink & Green. I love the Koi Iphone cover. I love the laptop covers - can't wait to get on!! I love everything the Lilly market bags (perfect for my local organic market!). And of course, those darling iPhone covers, in White Zin please! I'm a new follower of your blog, I've posted about this on my Facebook, and I've fanned both MD Pink and Green and Preppy Princess. PP has so many great things for sale! I absolutely love the laptop bags, need a new agenda, and am dying for an iphone so I can get one of those fabulous cases! I also love the Lilly umbrellas. I also follow Maryland Pink and Green! Thanks so much! What a FUN giveaway, Bethany and PP! You guys are awesome. I follow both blogs, both of you on Facebook, so I think that gives me 5 entries. I have my fingers crossed! All of them! I'm a new follower--so glad I found your blog. Cheers! I love it all, but I'm partial to the laptop sleeve. Thanks again for such a fun giveaway. Thank you for doing such a amazing giveaway!! Love all the items on Preppy Princess, but I did not even know that a Lilly water bottle existed!! I would definitely remember to use a reusable bottle if I had such a cute one! Already follow your blog and love it! This giveaway makes me smile! I'm a blog follower, I put up a post about the giveaway on my Facebook page, I'm a Preppy Princess fan and a Maryland Pink and Green Fan, and I tweeted about the giveaway! 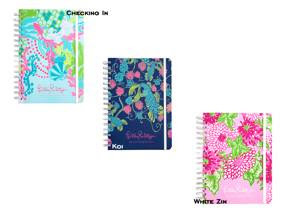 And I love the Lilly 2011 agendas at the Princess! Here is my comment Bethany - I love reading your blog - checking in and catching up. Thank you for a great offer - at the preppy Princess - I love the iPhone covers and an umbrella always makes the rainy days brighter!!!!! Thanks again!!! have a Happy Summer!! I can't believe I nearly missed this giveaway. So many great things, it's hard to pick just one. Right now, my top three favorites are the adult water bottle, the umbrella, and the mugs! I "like" the Preppy Princess on facebook. I love the new fall umbrellas! I absolutely adore the new Lilly Pulitzer umbrellas on Preppy Princess! I want one to match my agenda! I am a (longtime) fan of the Preppy Princess on Facebook. I am now a fan of Maryland Pink & Green on Facebook. I tweeted about this giveaway (My twitter name: MaysieO). I am a fan of Preppy Princess on FB. I am also a fan of Maryland Pink & Green on FB!